In my 11 seasons behind the dish in a men’s wood bat league, I’ve tried several sets of catchers gear in search of the perfect combination of lightweight materials, maximum protection and of course, gear worn by the pros. 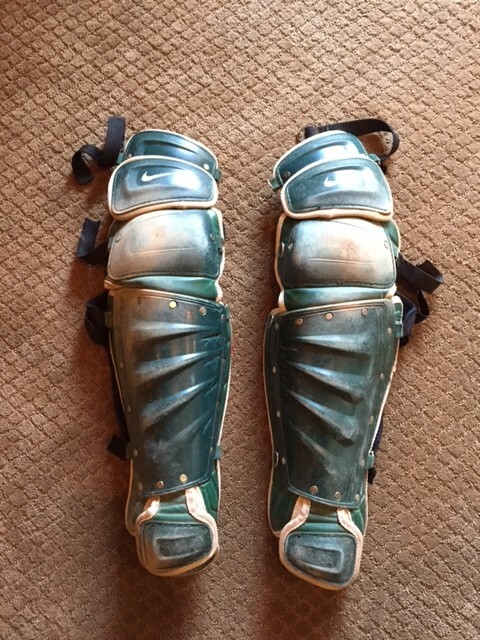 During my first year of catching, I purchased my first mixed set which included a Wilson leather-padded traditional A3007 mask, Nike Pro Gold chest protector (1st generation) and Wilson A3422 leg guards. I was a big Ivan “Pudge” Rodriguez fan growing up and his Wilson gear stood out to me as the best looking set during his time. He donned the same mask I had along with the custom-colored Orlon chest protector and similar leg guards. I’ve always loved the look of the old school traditional mask over the hockey style mask. It just creates that gritty, down and dirty look of a catcher. The mask just “flows” with the rest of the gear. In the case of the the Nike Titanium mask, it definitely flows with the innovative, lightweight theme of the entire set. The cage, silver in color to contrast the color of the pads, is extremely light. No other mask even comes close. The mask feels weightless on the face when worn. The pads incorporate vinyl on the outside and soft, black dri-fit fabric on the inside. I tend to sweat a lot as a catcher and the Dri-fit material does an excellent job in the absorption of sweat and saliva as well as providing odor control. 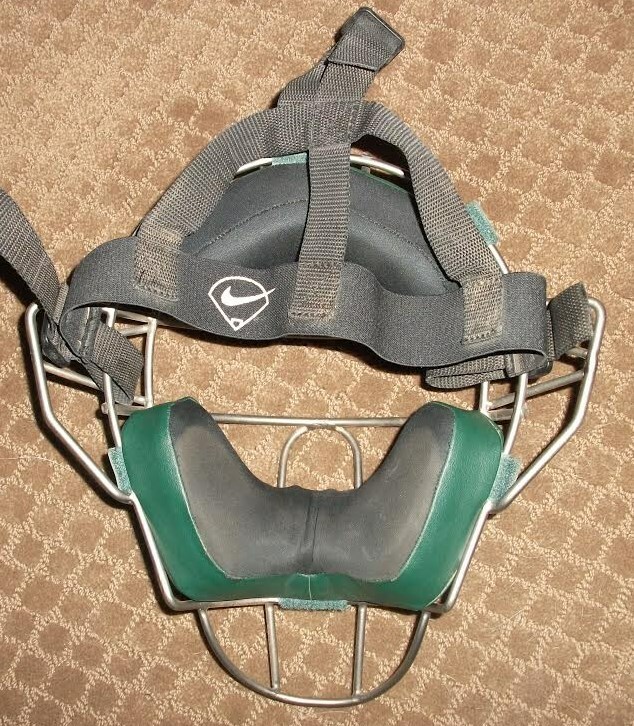 I like to wear my mask a bit higher on my face so that while in a squat, I can have my eyes looking up at the pitcher without having the center eye bars blocking my view. This allows me to lift my eyes up only slightly to see the incoming pitch versus having to lift my head then lower my head to track a pitch. With the lower padding sitting closer to my bottom lip versus the chin, the smell is not as evident compared to other leather lined masks. 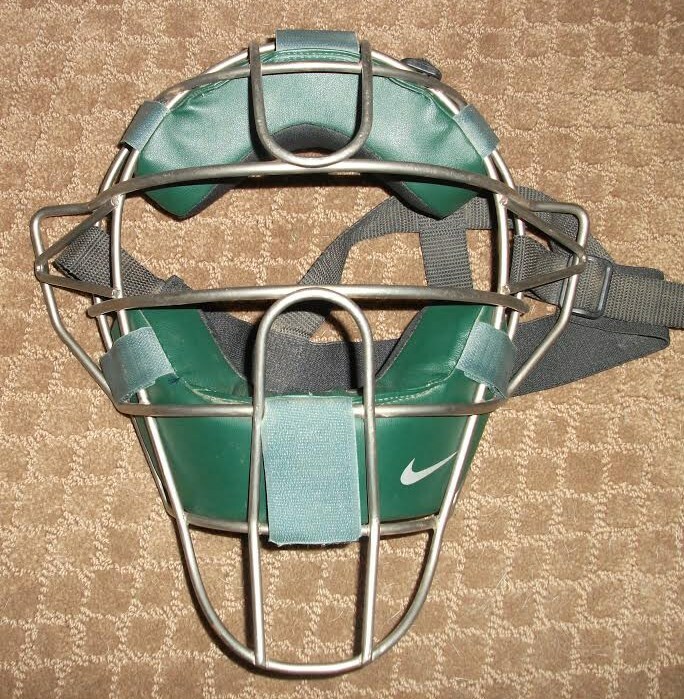 I have not experienced any major issues on foul tips or blocked pitches to the mask. Although there has been past concerns over concussions from foul tips experienced by Major Leaguers, I believe lower levels of baseball such as my men’s league should not pose a problem. I’ve taken heavy shots square in the face and came out perfectly fine. 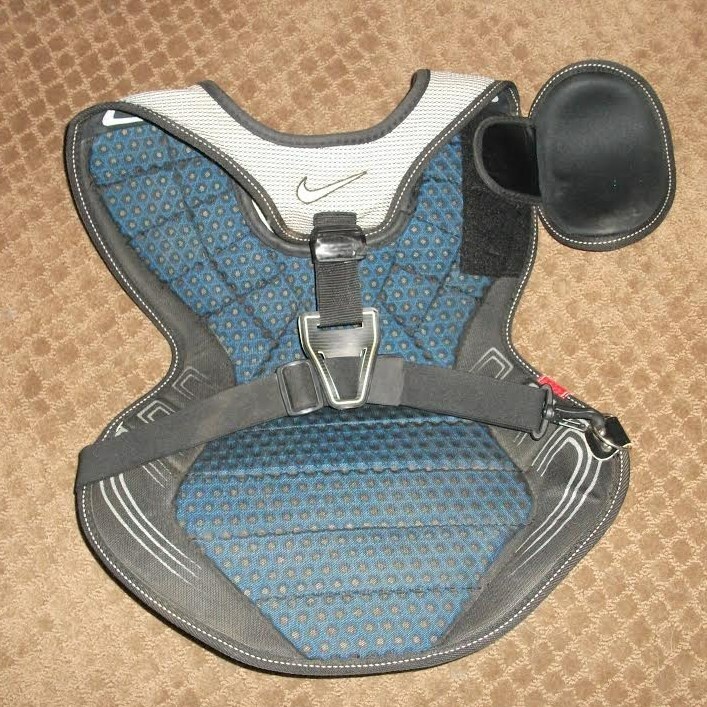 The harness is standard elastic with plastic side adjustment tabs and a painted Nike Baseball Diamond logo. Standard elastic harnesses have always done the job well in holding the mask in place even compared to the All-Star neoprene harnesses. I have also added a Rawlings sun visor in silver to the mask. The visor performs very well in sunny conditions and I have never needed to wear sunglasses while catching. The 17″ chest protector has a Lycra spandex front with memory foam padding similar to the 1st Gen. protector. The bottom oblique side padding is firmer than memory foam and gives added protection on mis-blocks that do not hit the center of the chest. 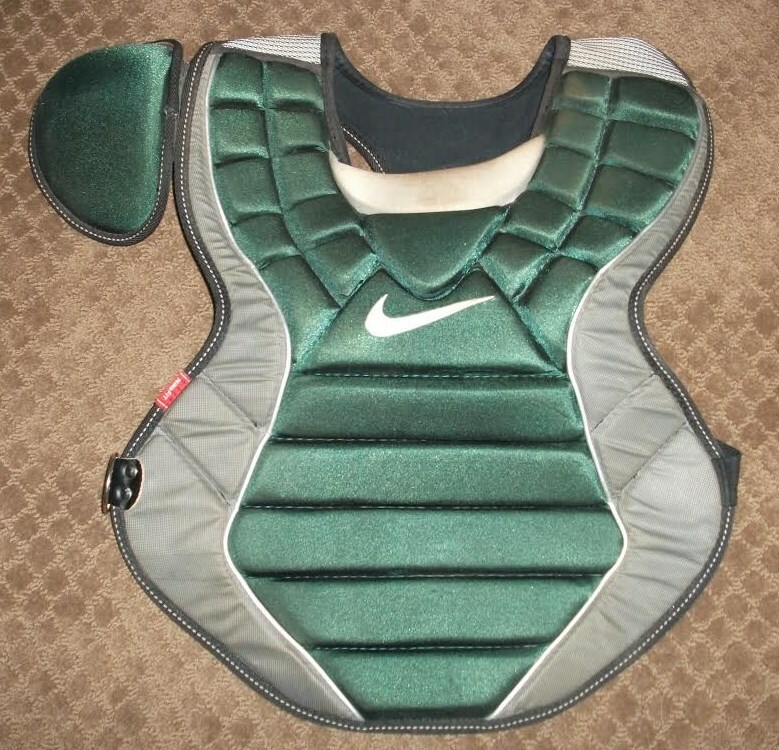 Typical neck pad and detachable shoulder pad. The upper portion of the harness has a soft lining around the neck to eliminate chaffing or irritation especially after heavy sweating. The harness seamlessly connects with the upper shoulder padding and comfortably drapes the shoulders to ensure a secure and close fit. Adjustments are made with the plastic adjustment tabs on nylon straps connecting the upper harness and the waistband. The waistband is heavy elastic sewn directly to the protector at the left hip and carabiner clip on the right. The chest protector is extremely light and breathes very well. I’ve used this protector in 95+ degree desert heat but the inner Dri-fit lining does an excellent job wicking moisture away from the body for quick drying. The protector stays close to the body and eliminates the need to be pushed up or readjusted every time a catcher runs or makes a throw. The harness adjusts well to any body size, from large physiques like Joe Mauer to even skinny 5′-10″, 155 pounders like me. The shoulder cap is built substantially and solidly but very lightweight. Throwing, blocking and running in the protector is easy. I honestly can not think of one flaw of the chest protector. Last but not least, it looks great. The leg guards are built with an asymmetrical knee cap design to allow a flatter surface for more stability during throwing or blocking. Dri-Fit lines the inside with weight reducing Hex-vent padding installed at the soft areas throughout the leg guard. 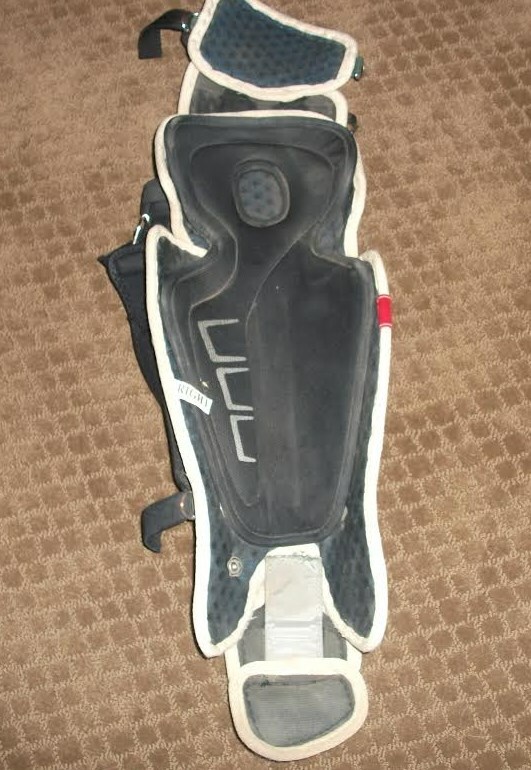 An inner sling provides additional padding surrounding the knee cap and shin. Four straps secure the guard to the leg at the upper thigh, knee cap, below the knee and ankle. I prefer this style of 2 strap knee placement compared to the 3 strap placement as this greatly reduces the irritation felt behind the knee while squatting. Toe protection is a removable, double cap with Velcro attaching the lower cap to the fixed upper. The leg guards are light but not the lightest I’ve used. I believe Mizuno makes the lightest leg guards on the market through its Pro and Samurai lines. Running is not as comfortable as I hoped due to the bulky shin design of the guards. The plastic protectors at the shin and knees provides more than adequate protection on foul tips and sliding runners at home. The knee design gives more stability on throws back to the pitcher and dropping to the knees to block. The inner lining wicks moisture extremely well with the Dri-fit materials. The Nike set does extremely well in being innovative in design with a great emphasis on the details and looks. The titanium mask is not the cheapest one out there, but is the lightest on the market. eBay is the best source for purchase so keep an eye out if anyone of you out there are interested. The masks will start at $300+ but its worth the investment if you love traditional masks and intend to catch for a long time. The chest protector is very light and I especially love the harness design as this provides the proper and comfortable fit for a slim catcher like myself. The asymmetrical leg guards are probably the most innovative part of this set although I believe weight could have been reduced further on the shin for better mobility. The Nike Pro Gold Precision set is the best looking set out on the market today and if catchers are looking for style and function, this is the set to go with. Lightweight materials combined with top-notch style and innovation make it one of the best catcher sets available today. Again, the best place to look for these items is eBay. This doesn’t have to do with the gear, which I have and find it very nice. I’m starting to come off of a pretty bad elbow injury from getting hit by a pitch on my elbow. I haven’t really tried an elbow guard yet but I was wondering which ones you’d recommend besides evoshield, thank you. hey avery. thanks for the comment. honestly I have never worn an elbow guard, but i see the pros wearing a company called belgard more often lately. i don’t think they’re available to the USA yet, but you can do some hunting. other than that, evoshield is the most prevalent by a long shot. Marucci also offers an elbow guard, worn by Jose Bautista and David Ortiz.